Here’s the latest in our series of entertaining interviews with a diverse array of your fellow SHA members. Meet a member for the first time or learn something about a colleague that you never knew before. This blog series also offers current members an opportunity to share their thoughts on why SHA membership is important (Camaraderie? Professional service? Exchange of ideas in conference rooms and beyond? You tell us!). If you would like to be an interviewee, please email the Membership Committee Social Media Liaisons Eleanor Breen(ebreen@mountvernon.org) or Kim Pyszka (kpyszka@aum.edu). Michelle Pigott is a graduate student at the University of West Florida. 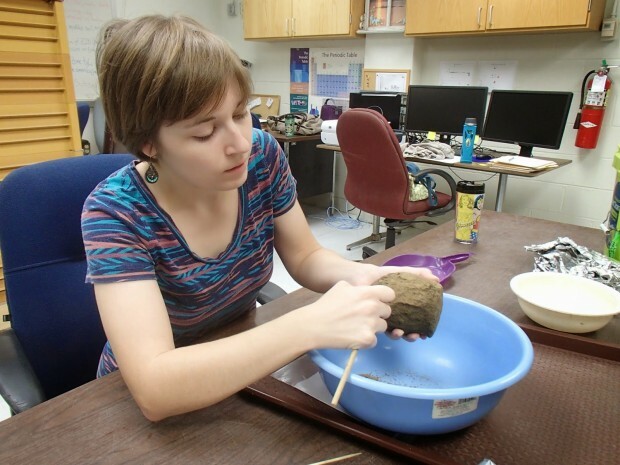 Her master’s thesis discusses culture change in two Apalachee Indian communities during the 18th century using detailed ceramic analyses. What are you currently reading? Well my “for fun” book right now is Cibola Burn by James A. Corey, the fourth of a series of excellent hard sci-fi novels. Archaeologically speaking, I am reading The Native American World Beyond Apalachee: West Florida and the Chattahoochee Valley (John H. Hann, 2006) and French Colonial Archaeology in the Southeast and Caribbean (Kenneth G. Kelly and Meredith D. Hardy, editors, 2011), both of which are providing excellent background information for my master’s thesis research. What did you want to be when you grew up? In my elementary school years I was fairly certain I would grow up to be a paleontologist, however, discovering a cache of old Egyptology coffee table books at eight years old left me obsessed with archaeology (I had pyramids painted on my bedrooms walls well into high school), and while my interests have shifted continents and time periods, I’ve never looked back! Why are you a member of SHA? As a graduate student, being in SHA opens up so many opportunities to be in tune with current international research, as well as great networking. Plus it’s an awesome excuse to go and visit new cities for the annual meetings! At what point in your career did you first join SHA? When I was in my second year of graduate school. Which article from Historical Archaeology has been the most influential to you? Well right now, as part of my thesis work, I’ve been reading up a lot on the theory of “creolization” and how it’s best used to discuss culture change in North American Native Indian communities. I’ve found three articles, “From Colonist to Creole: Archaeological Patterns of Spanish Colonization in the New World” by Charles Ewan (2000, 34(3):36-45), “The Intersections of Colonial Policy and Colonial Practice: Creolization on the Eighteenth-Century Louisiana/Texas Frontier” by Diana DiPaolo Loren (2000, 34(3):85-98), and “Creolization in Southwest Florida: Cuban Fishermen and “Spanish Indians,” ca. 1766-1841” by John Worth (2012, 46(1):142-160), to be especially helpful on this diverse topic. Which benefit of belonging to SHA do you find the most beneficial? It’s definitely a tie between access to all the journal articles (online!) and being able to attend the annual meetings. A conference full of presentations just on historical archaeology? Yes please!